Adds protection to oiled, waxed and lacquered wooden surfaces, ideal for floors and furniture. With nurturing waxes, including sustainably sourced Brazilian Carnauba palm wax, it revives and refreshes dull and scratched surfaces and is perfect for areas that require extra resistance to water and spillages. Suitable for lacquered wood, laminate, vinyl, linoleum, cork, natural stone, unglazed tiles and polished concrete. 2. Freshly sealed surfaces should be fully dry. 3. Shake thoroughly before and during use. 4. Working in sections apply undiluted Refresher with the grain working wet on wet, avoiding areas that have already dried. 5. Wipe onto the surface following the grain. 7. Protect surface from water for 24 hrs. 8. After care: Re-apply undiluted Refresher periodically as required. 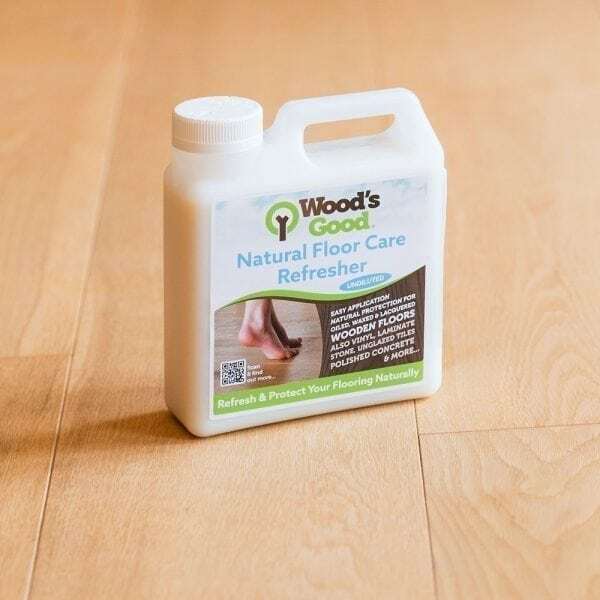 To clean use Refresher as a water additive or Wood’s Good Natural Floor Care Spray.